Have you ever fell in love with someone who meant harm to you? Yes, I’m talking about the bad guys, wrong girls at the right time, or mischievous thief—to name but a few—with whom you are least impressed, but gradually surrender your heart to them. This symptom makes us feel like Stockholm Syndrome is happening on us. Well. My recent experience at Stockholm may not be so intense as those people captured decades ago, but I was trapped in the places and by people with whom I never thought I would easily fall in love. I planned to head up to Tromsø, Europe’s northern most city, to experience the Northern Light, and I had to use Stockholm as my flight hub. As all hope led to Tromsø, I prepared nothing for Stockholm. This was how, when and why Stockholm quietly held me captive and robbed my sentiment from the whole trip. Winter time in Europe means low season for tourism. Hardly any tourists like to bundle up and roam outdoor during winter season. Little do we know that Swedish cool air is somehow tamed by the water ways crisscrossing the city. As Gulf Stream turns warm in the Winter, Scandinavia could be even warmer than many countries in Central Europe. The chilly air was rather refreshing and kinder than how I first feared. Outdoor strolling along Stockholm’s old town was a joy to linger on. Visiting a Scandinavian countries, one can be easily lured by the Caucasian iconic model—blue eyes and blonde hair. That is not yet the total package in Sweden; Swedish people are jovial, well-mannered, chatty, and ready to help their guests. It is not unusual to stop a Swede to ask for direction and receive a bunch of advice at the end. If Swedes happen to spot us trying to do a selfie by any tourist spots, they are quick to offer help to take pictures for us. Locked in one-night-sojourn, I decided to spend a large portion of my day at Vaseet museum, which exhibits enormity and epitomizes beauty of Sweden’s arts and civilization centuries ago. The museum, yet, sits there to openly admit to and teach its visitors that Swedes are not infallible. To err is human. Each country’s money always adds zest to our journey. The neatly designed bank notes, different sizes of coin, and skill in calculating the exchange rate can make us feel confused and, at the same time, fun. My expectation to handling Swedish colorful bank notes was aborted by Swedish people’s extensive Fin-Tech. Using cash is rare in Scandinavian countries and cashless practice may appear to be troublesome for many of us. However, such practice turns out to allow sensible livelihood; it gave me a quick checking at eatery or any purchase, and a worry-free feeling from miscounting or picking wrong notes and coins. Despite the newly launched attractive series Swedish bank-notes, I had fun using the notes as much as I enjoyed adventuring Swedish innovative feature of Fin-Tech. Who says Scandinavian food is bland when comparing to others in the more southern lands of Europe? My favorite dish is shown in the picture above. Yes, Swedish open shrimp sandwich is just divine to me. Open shrimp sandwich is so common in Stockholm that you can find it almost everywhere from café in the museum all the way through a fine dining restaurant. Sweden’s abundant fruit-de-mer from her fertile aquaculture bring in the country broad choices of recipes. 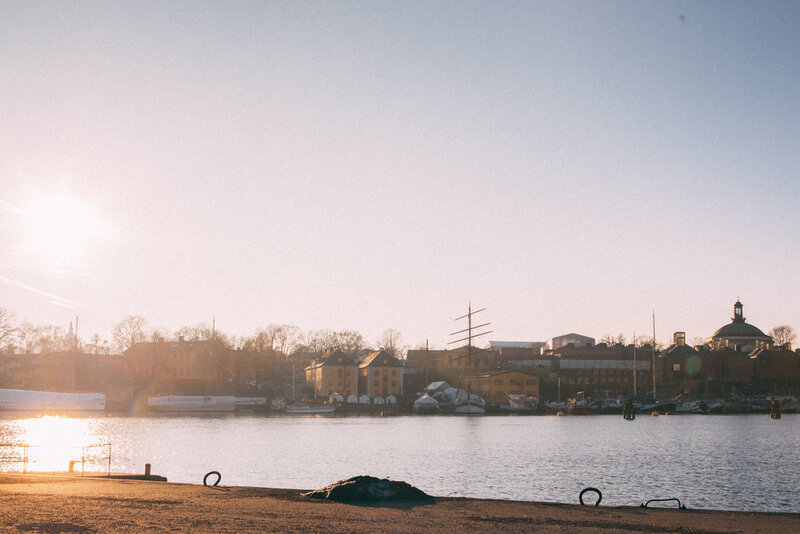 As one of the world’s busy marinas, Stockholm not only houses numerable residents of yachts and sails, but welcomes new tastes these seafarers would bring home too. Visitors from Asia usually think of Europe with the image of renaissance or classic arts –something elaborated with gilded gold and flamboyant sculpture. This may not be the case in Scandinavian countries, especially in Sweden. Think of Ikea and what makes it popular: practical, simple, and friendly-using. Scandinavian furniture speaks for Scandinavian people and their lifestyles. The enduring craftsmanship on woodwork, the subdued tone and manners of materials, and the monotonous yet sophisticated elements of textures reflect what Swedish people have to offer. These are five aspects to which I first dreaded to come closer. They were not the love at first sight, but they stay last in my memory. Stockholm syndrome needs not to happen in a bank; it happens easily to anyone who are not prepared to like Sweden and her people, and its memory lingers on.